Alan Flusser wrote the rulebook of classic menswear. Dressing the Man: Mastering the Art of Permanent Fashion has sold more than 190,000 copies and has been one of the most influential texts in men’s fashion. It’s a must-read for anyone looking to learn the foundations of traditional menswear. 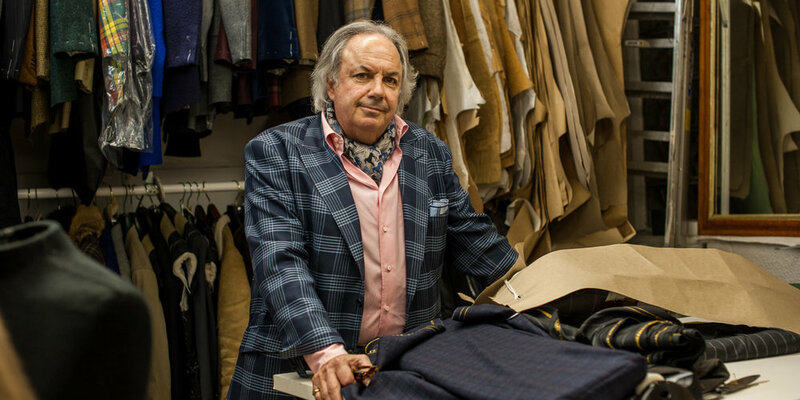 In addition to being a best-selling author, Alan has been a custom clothier in New York City for more the 25 years, working with some of the world’s most discerning clientele, as well as creating wardrobes for iconic film characters like Gordon Gekko in Wall Street. We recently had the honor to spend an afternoon with Alan at his midtown manhattan store, talking shop and getting to know the man behind the book. As you might expect from a man who wrote a rulebook on dressing and has spent his time with the world’s dandiest dressers, Alan describes his style as “somewhat snobbish and self-absorbed.” Nevertheless, his breadth of knowledge and candor offer useful insights for anybody interested in personal style. Alan was good enough to share with us his uncensored thoughts on the current state of the menswear industry, the rise of the fashion blogger, and how to become a better dresser. “If I had to grade the menswear industry based on the number of well-dressed men they turned out every year, it would be hard to give them anything other than an F. Considering, if you will, all the menswear industries in each country around the world, all the men’s specialty and department stores, wholesale businesses, designer fashions, fashion schools, men on the street, etc … and all Vanity Fair (or any other like organization or authority compiling a yearly best dressed list) can unearth (after you subtract those men proposed because of their celebrity) is maybe three or four legitimate candidates each year. Someone has to explain this to me. “I used to advise young men interested in learning how to dress well to find someone selling clothes who dressed like he wanted to and ask him to recommend a few things to wear, even if they were too expensive. Then he could go elsewhere and try to find something similar at a more affordable price. However the number of capably dressed salespeople at retail has steadily decreased over time. “My dressing style is one of some contradiction, while I have never let classical boundaries or traditional high-class guidelines dictate my own taste in clothes, they play a very large role in how I think about the overall subject. And in lock-step with other self-proclaimed sartorial masters of the universe, I have always dressed only for myself. “Mine is a mélange of idiosyncratic frivolity tempered by hopefully, high-brow taste. What a mouthful, that has to sound somewhat snobbish and self-absorbed, and I must admit, many times it is. However, since a young man, I’ve never shied away from wearing clothes that others didn’t understand or appreciate. Even then I was arrogant enough to believe I knew more than my critics. “It has never been harder for a man to learn how to dress well. Because so much of the early learning process depends on the correct information, this is a gigantic stumbling block which is not getting any smaller. 1. Take total personal responsibility for the buying of your clothes and the development of your style-learning curve. 2. Read every Apparel Arts, pre-1945 Esquire Magazine, and 1930’s, 40s, and 50s Adam Magazine that you can get your hands on. 4. Learn what proportion of clothes fits your body and why; what colors flatter your individual complexion and why. Did I mention why – that’s the essential part of the equation. As an example, which collar shape most flatters your face and why? What’s the ideal jacket length for your body and why, and so on. 5. Fashion means those clothes that are deemed important and stylish at a particular moment in time. As time changes, so does fashion. You must learn to separate fashion from style, the first is tied to time, and the latter is not. Whether a particular look is right for you, for your complexion or for your build is not a question of fashion, but of anchoring long term style based on its two benchmarks – your personal architecture and complexion. They should drive each and every fashion or style decision. 6. Dressing well is much less complicated and difficult than generally thought to be, the challenge is getting the right information for you and you alone. 7. Learning how to dress well is an art form, okay a minor one. Before you can bend or even break the rules, you need to know what they are and how they relate to your own physique and complexion. These rules speak to how’s and why’s of sartorial correctness. After getting to know them better, then, and only then, should you try pushing against them to begin building an enduring, long term, and personalized dressing style – the ultimate goal. There are no shortcuts here. Should anyone doubt the value of knowing about sartorial correctness relative to holding fashion’s excesses at bay, a quick look at any Oscar Awards from the past thirty years will confirm just how far afield the uninitiated lad can be led. Armed with the new-age encyclical of “doing your own thing,” tradition-emancipated men wander about looking like victims of some failed fashion Ponzi scheme. Thanks, as always, for reading and special thanks to Mr. Flusser for participating! *All images courtesy Articles of Style. View the original post on Articles of Style.